KIEV, Ukraine -- Ukrainian President Viktor Yanukovich will scrap in early May a decree by his pro-Western predecessor that conferred national hero status on a World War Two nationalist leader, a source in his camp said on Friday. Former President Viktor Yushchenko's posthumous honoring of Stepan Bandera, a leader of Ukrainian nationalist forces which fought both the Nazis and Soviet forces in the war and after, angered Russia, EU member Poland and Jewish rights groups. Yanukovich, seen as more pro-Moscow than Yushchenko, promised on a visit to Moscow this month to repeal the decision and also cancel a similar honor earlier conferred on Roman Shukhevych, Bandera's right hand man. But the issue is a sensitive one in Ukraine and since Yanukovich's visit to Moscow, some aides have suggested he might back-track on his promise. Bandera, who fought Soviet rule well into the 1950s and was assassinated by a KGB agent in 1959, is regarded as a hero by many in western Ukraine where wariness of Moscow is strong. Most people living in the Russian-speaking east of the country, however, adopt the Soviet view that he was a terrorist. 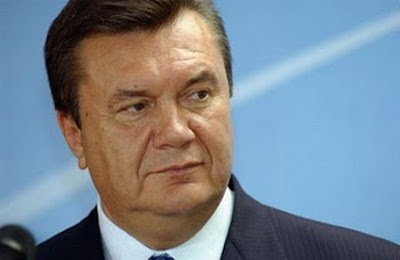 A source in Yanukovich's camp said on Friday: "He will go ahead with this decision on the eve of May 9. He will go ahead with it. That is certain." May 9 is when Russia marks the World War Two victory over Nazi Germany. Some historians say Bandera's nationalist followers initially cooperated with Nazi invaders of western Ukraine, then part of Poland, and took part in the killings of Jews and Poles. The Simon Weisenthal Jewish human rights center has expressed "revulsion" at Yushchenko's award to Bandera and condemned it as a "travesty."